The transformation of Palomar Hospital is seen in Escondido as the key to the future growth of the city. The developer that bought the site plans to build only 450 units — one third of what’s allowed there. The old Palomar Hospital towers above downtown Escondido on land zoned for high-density housing. But when Integral Communities, a developer, filed its initial vision for the site in December, the blueprints took officials by surprise. The developer plans to build only 450 units — one third of what’s allowed there. In the midst of a statewide housing crisis, with approximately 14 acres of downtown real estate near transit lines and job centers, one of the nation’s largest home-builders has significantly curtailed its own project before any serious opposition reached the surface. There’ve been no public hearings on the designs yet. That’s not unheard of, but it goes against the grain of region’s politics, which are shifting as California puts increasing pressure on cities to build more. In San Diego, the City Council recently chewed out a developer for offering a project that wasn’t dense enough. And San Diego’s mayor this week, in his State of the City address, proposed eliminating height limits near many transit stations — the opening shots in a war that could remake the urban tableau. The transformation of Palomar Hospital is seen in Escondido as the key to the future growth of the city. 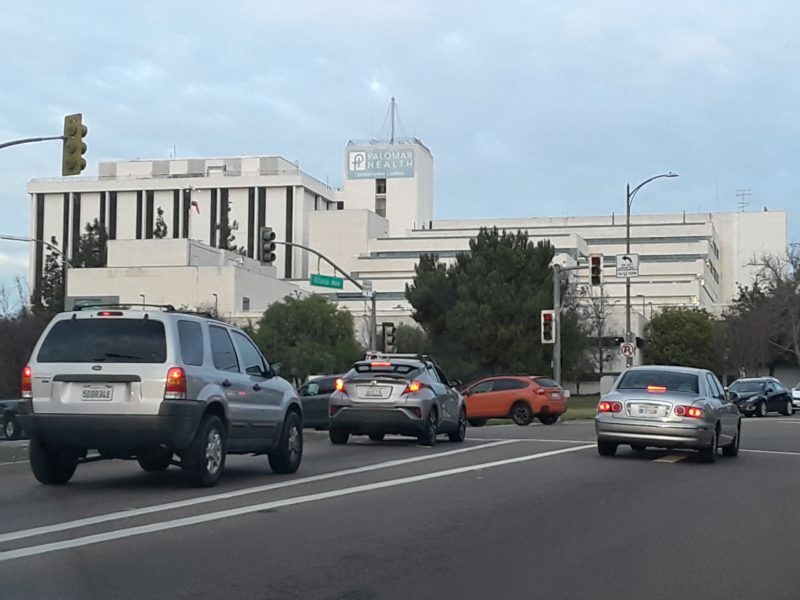 In early 2018, when the Palomar Health District sold the site to Integral Communities — most of the hospital’s remaining services are moving to a new medical center, several miles away — for $18 million, city leaders sounded high on their own optimism in press reports. The land is zoned for 100 units per acre, meaning it could hold around 1,380 units. Integral Communities did not respond to multiple requests for an interview but gave a sense of its thinking in a memo that accompanied an application filed Dec. 24. One of the objectives of the project is to provide a housing “density that respects the surrounding community and supports the existing commercial uses in downtown Escondido,” the developer wrote. Indeed, the immediate pushback to the project came from neighboring merchants, who expressed concern that the additional commercial space might saturate the market. They cited already vacant and underutilized storefronts along Grand Avenue that could be filled first. 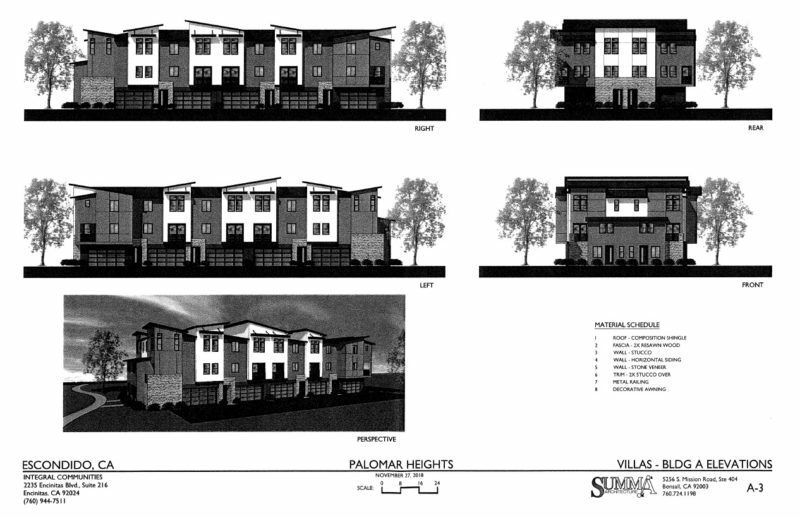 The initial plans for the site — which the developer is calling Palomar Heights — would spread the 450 units across 29 buildings, which look like rowhouses. Apartments and 5,500 square feet of commercial and office space would be spread among three separate buildings. The plans don’t yet include any details about height. Alex MacLachlan, a real estate investor and president of the Escondido Downtown Business Association, told Voice of San Diego that he’s pleased a majority of the units in Palomar Heights will be condos that people purchase and therefore own. But he does have at least one lingering concern: the design. The old hospital served as a downtown focal point at the apex of the hill, and he hopes the developer finds something to put in its place. MacLachlan also thinks the rowhouses could use some work. As a former contractor, he said, the cost of higher density — which could include the conversion of wood to steel frame and subterranean parking — probably did not pencil out for the developer. The project is under review by multiple departments at city hall and officials are expected to begin making comments within weeks. The necessary environmental reviews could take a year or more. At some point, it’ll need to go before the planning commission and finally the City Council for discussion. As the sun set midweek, Grand Avenue was a steady stream of automobiles hurrying to reach the freeway. The streets were mostly vacant, except for a small group of guys gathered outside a game store that hosts role-playing competitions, like Dungeons & Dragons. Some people consider this area rough. Ted Apollo, the shop’s owner, is not one of them. “By 8 p.m., it’s like a ghost town,” he said. Paul McNamara, Escondido’s new mayor, has said he’d like to turn downtown into a mini Gaslamp, referring to San Diego’s historical district and tourist trap. Apollo sees the potential in downtown Escondido for a new North Park. They use different metaphors but are roughly talking about the same thing — an urban environment that exudes energy. Apollo said he understands why other merchants are eyeing the renovation of the district with skepticism. Personally, he looks forward to the new housing on the old hospital site, whatever the number of units, because it’ll help make the downtown more pedestrian friendly and improve transit. “We need to get away from the suburban mindset,” he said. I asked Escondido’s director of community development, Bill Martin, if he knew why the developers had offered 450 units as opposed to the maximum 1,380 units. If the project survives as it was introduced, the remaining 930 units could still get built — in another part of the downtown. City staff are considering a new program that would allow developers to essentially transfer the units they don’t use to others. For instance, if one area of downtown allows for 75 units per acre, but a developer wants 100 units per acre, that developer could grab an additional 25 units that, say, Palomar Heights didn’t use. Of course, adding those additional units would still need to go through the normal channels for approval, but it would allow developers to “recapture” units that others leave behind. And it would allow officials to get closer to the 5,275 units stipulated in Escondido’s downtown plan. This idea is technically known as a “density bank,” but it would operate more like a pool, where developers take some, leave some, depending on what they can afford. Maya Rosas, the founding president of the YIMBY Democrats of San Diego County, a group that favors building more housing, said that type of program could be exciting for a city like Escondido.